In a world dominated by sequels, reboots, remakes and even films based upon amusement park rides and board games, the death of original filmmaking and the concept of cinema as an art form seems closer than ever. 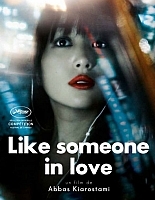 Yet Iranian director Abbas Kiarostami, who returns to the 65th Cannes Film Festival this year with Like Someone in Love (2012), stands tall as a bold, experimental and often challenging mercurial talent. Name-checked by the likes of Werner Herzog and Jean-Luc Godard as a source of cinematic inspiration, Kiarostami is esteemed amongst his fellow directors, even if he is not often beloved of audiences. Following on from the success of the mesmerising and beautifully poised Certified Copy (2011) starring Juliette Binoche, Like Someone in Love (previously entitled simply The End) looks to be something of a thematic continuation, presenting audience with another examination of the ambiguities and complexities of human relationships; this time between a student who finances her studies through prostitution and an elderly academic who is one of her clients. Taking its title from the popular standard made famous by Dinah Washington, amongst others, a trailer has leaked onto the internet but other than that very little is known. Having won prizes before, Kiarostami is something of a favourite with European festival juries. He has not only won numerous prizes throughout his long career, he has served as a jury member in Cannes several times, as well as at other festivals such as Venice and has also served as president of the Camera d’Or jury in Cannes in 2005. Prior to Certified Copy, Kiarostami’s Shirin (2009) was perhaps his most experimental film, consisting as it did entirely of faces in close up as they watched an unseen film, apparently based on a Persian epic. Like Someone in Love is unlikely to be so radical, but festival goers will be anticipating a meditation on love and its costs from one of the most challenging auteurs at work today.